Oh, how I love a layered dip with chips! During football season, I always make a big layered bean dip with corn chips on the side (always a winner! ), but this Mediterranean-style dip is a brilliant alternative to the classic standby. It's a meze platter all in one with beautiful layers showcasing each tasty ingredient. 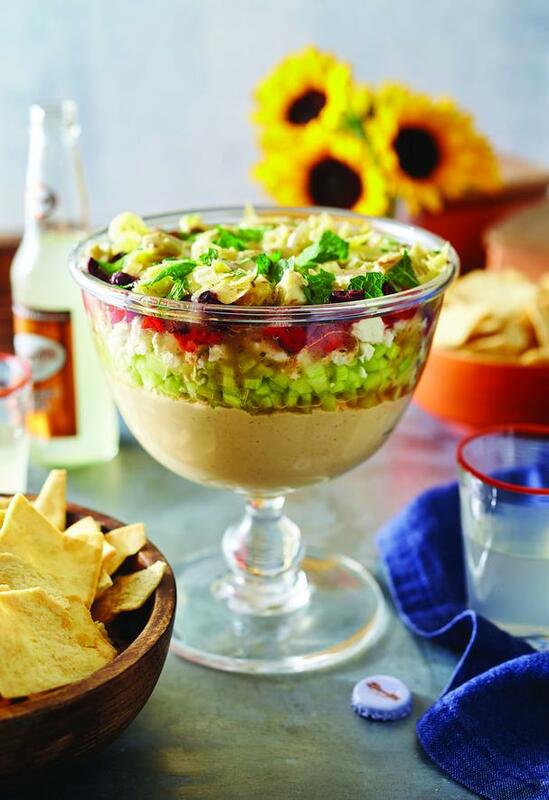 Get a glass bowl, preferably a trifle bowl, and layer hummus, cucumbers, crumbled feta cheese, roasted red peppers, olives, artichoke hearts, mint, drizzle with vinaigrette, and serve with pita chips. 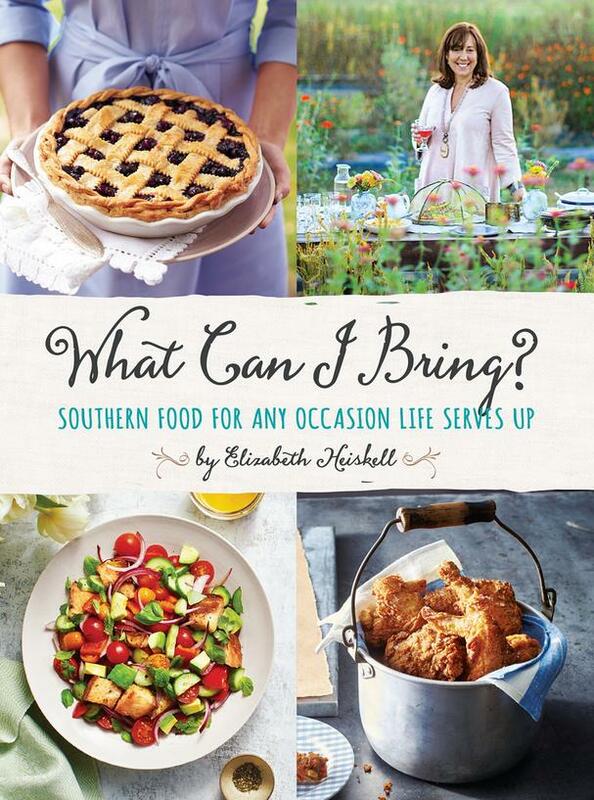 This recipe is just one of over 100 delicious and easy recipes from What Can I Bring?, a new cookbook from Elizabeth Heiskell, author of the popular monthly column bearing the same name in Southern Living magazine. Recipes include delicious and comforting Southern dishes for every meal of the day and every occasion with chapters covering events like Potluck and Road Trip Roadies to Under the Weather and Four Quarters & Food. Read more about her cookbook and also get the recipe for her scrumptious Hangover Sliders here! Spoon the hummus into a large trifle dish. Top with the cucumber, feta, red peppers, olives, artichoke hearts, and mint. Drizzle with the Vinaigrette. Serve with the pita chips. Whisk together the vinegar, honey, mustard, garlic, salt, and pepper in a medium bowl. Add the oil in a slow, steady stream, whisking constantly, until smooth. Note: You can use a food processor to combine the oil and the acid, but it’s easy to overprocess the liquids and they can become thicker than gravy. If the dressing gets too thick, add water to thin the dressing; do NOT add more oil, because that will only make the problem worse. *Most vinaigrette recipes call for some kind of mustard. It acts like a marriage counselor: It keeps two things together that don’t want to stay together. Excerpted from What Can I Bring? by Elizabeth Heiskell. Copyright © 2017 Oxmoor House. Reprinted with permission from Time Inc. Books, a division of Time Inc. New York, NY. All rights reserved.